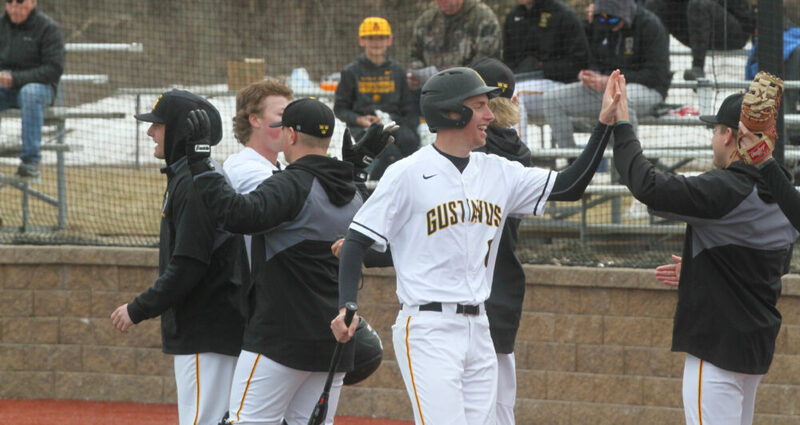 SAINT PETER, Minn. – The Gustavus baseball team will host St. Thomas in a MIAC doubleheader at 2:30 p.m. Tuesday. The games were originally scheduled for Saturday but postponed due to last week’s snowfall. Live stats and a live stream will be provided. Gustavus most recently split a doubleheader at Saint John’s on April 9, winning game one 2-0 and losing the second 4-2. The Gusties have split their past five doubleheaders. Through 20 games, Cole Pengilly continues to lead the offense with a .400 batting average (24-60) and 16 runs. Matt Berkner is next with a .339 average (21-62) and has 13 RBI. Sam Archer is slated to start game one on the mound against the Tommies. Archer will make his fifth start and holds a 4.63 ERA and 2-0 record after 23.1 innings. Christian Johnson is the probable starter for game two. Johnson owns a 4.44 ERA and 2-2 record after 24.1 innings. He also leads the team with 34 strikeouts. Damon Rademacher leads the team with 11 relief pitching appearances. He has a 1.69 ERA, 2-0 record, four saves, and 19 strikeouts in 16 innings. St. Thomas most recently split a doubleheader against Saint Mary’s on April 9, losing a 4-0 extra-inning affair in game one followed by a 5-4 win the night cap. The Tommies are 2-4 in the month of April, which includes getting swept by UW-La Crosse and a split with Macalester. Through 19 games, Kyle Halverson leads the offense with a .343 batting average (24-70) and five doubles. Adam Krajewski is next with a .298 average (17-57) and Ryan Lust leads the team with 14 RBI. Henry Decaster and Graham Laubscher both lead the pitching staff with 29.1 innings each. Decaster owns a 3-1 record and a 2.45 ERA and Laubscher is 1-2 with a 3.38 ERA. Nathan Sprouls has a team-high five relief appearances with a 3.46 ERA and a 2-0 record in 13 innings.